With the Dogrunner from Altranet, your dog can walk alongside your bike without the leash getting caught in the spokes or around the pedals. The bike leash fits nearly every bike with a frame thickness of 36 mm and is easy to fit. The weather is nice and you want to go for a nice bike ride with your dog walking alongside the bicycle. With the bike leash from Altranet, you can safely do this. The Dogrunner is a coil spring that can be attached to the frame of the bicycle through the use of the mounting clip. By attaching the dog's leash to the Dogrunner, you can keep both hands on your handlebars and your dog won't get near the spokes, pedals or other traffic. 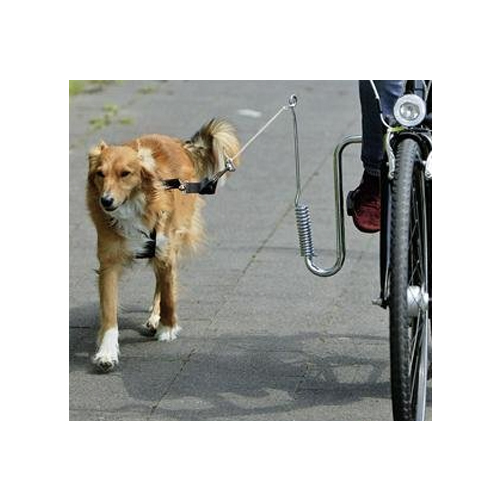 The coil spring of the bike leash absorbs any pulling from your dog, keeping the bike balanced. This equipment can be mounted on nearly any bicycle with a frame width of 36 mm. On days when you are not taking your dog with you, you can remove the coil spring from the bike thanks to the locking pin. The mounting clip will stay in place. This mounting clip is also available separately. This means that you can easily change the coil spring over to a second bike. What is the thickness of my bicycle frame? Measure the circumference of the frame in centimetres, using a measuring tape. Then divide this number by 3.14. The result of this calculation is the diameter of the frame. A frame with a diameter of 36 mm (3.6 cm) has a circumference of approximately 11.3 cm. Have you used Altranet Bike Leash Dogrunner before? Let us know what you think about this product.